SUPERSTAR falters, as Legend lacks. Cast as the Son of God in the 2018 stage/movie production of JESUS CHRIST SUPERSTAR, John Legend seems to have achieved his Peter Principle (rising to the level of his IN-competence). He has found his high water mark. There is something in the world he cannot do. In a powerful, well-staged, well-orchestrated production that features HAMILTON’s Brandon Victor Dixon performing stunning vocal acrobatics, Sara Bareilles as a poignant Mary Magdalene, and Alice Cooper (!) 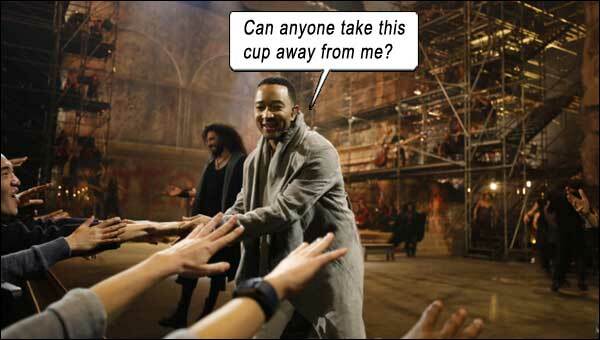 as a hilarious Herod, John Legend is weak sauce. Let’s cut right to the chase: In any SUPERSTAR, we want to hear how any new Jesus hits Gethsemane. That’s the barometer on which the production stands or falls. That’s the word-of-mouth generator. That’s the Jesus Audition. Let’s just say it: Jesus needs to slam that G5, or he’s not worth his salt. Can he do it with clarity, power, precision, conviction, air to spare? 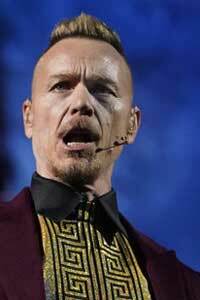 And how does it compare to the One True Vocal God – Ted Neeley? John Legend’s Gethsemane is like a ululating monkey realizing it can’t make its screech heard above the waterfall. He neglects the G5 after the dramatic 7/8 crescendo (“Why – should I die?”), and then rushes to the end before we realize we’ve been gyped. Playing apologist for John Legend, many have opined that he brought a “soulful approach” to the role – but this is a rock role! You don’t bring a knife to a gun fight; you don’t bring a gentle r&b voice to a power tenor fight. As nice of a soul and as great of an artist as John Legend is, he is wholly miscast in SUPERSTAR. After the 5/8 orchestral breakdown in Gethsemane, there is a smattering of perfunctory applause that sounds like Legend is playing a pub in Reseda, then it dies away like mice scattering when the light comes on; unlike the eternal applause that Neeley deservedly generates after that section! (Even in current performances, at 70+ years of age, Neeley and the band must wait for the adulation to die down before they can continue.) Yes, Legend eventually hits a G5, in some arbitrary section of the song, in a falsetto so watery, the American Beer Association called and said it wanted its recipe back. Someone wrote, “They tried a new type of voice for Jesus and it worked.” Everything in that sentence is wrong. Firstly, “they” didn’t “try” anything – Legend is in the role because he is one of the executive producers. It wasn’t a board of musicians pondering on what type of voice to “try” for Jesus – it was John Legend himself saying, “See all this money and influence and reputation I’ve brought? Right, so I’m Jesus.” And it doesn’t work. And I can’t help but wonder if Legend was being arrogant in thinking he could pull it off, or just ignorant of the part and its challenging, nigh impossible, melody lines. Some comments just blatantly wished for – Adam Lambert. I concur. Legend’s first lines are actually very good (from What’s The Buzz? ): “Why – should – you – want to know…” Clear and strong. Staged before a live audience, we can hear a happy cheer go up; at that point, I think we all envisioned this Legend cat could, in fact, pull off the stellar highs, but as the night wore on, Legend started to strain for the range that seemed to always be just one quartertone out of his reach. 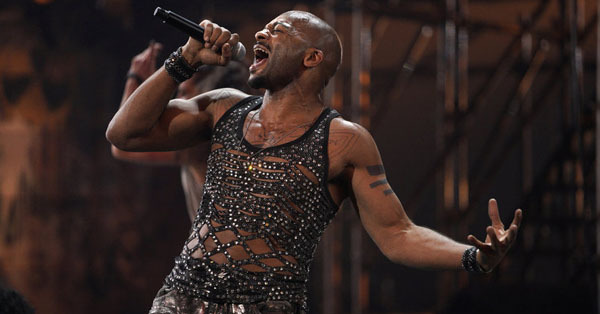 Brandon Victor Dixon: Jammin’ Judas! Legend’s and Dixon’s second confrontation, where we can compare apples to apples – meaning they sing the same melody line one after the other – is Everything’s Alright, a song moderated by Mary Magdalene (“Sleep and I shall soothe you / Calm you and anoint you…”). In the ’73 film, when Judas Anderson faced down Jesus Neeley, and blasted that high B, Jesus came right back at him with the same power highs. It was the dark against the light, equally matched – the dark with balls and grit, the light with cutting crystal – which is what made the battle worthwhile. Here, DARK WINS EASILY. Poor John Legend, so out of his depth, Dixon bulldozes him unintentionally. In reply to Dixon’s head/chest B, when Legend hit that falsetto B, with a face that said, “Thank goodness we have audience prompters to make them cheer for me here,” I thought Dixon was going to break character and just laugh in Legend’s face. 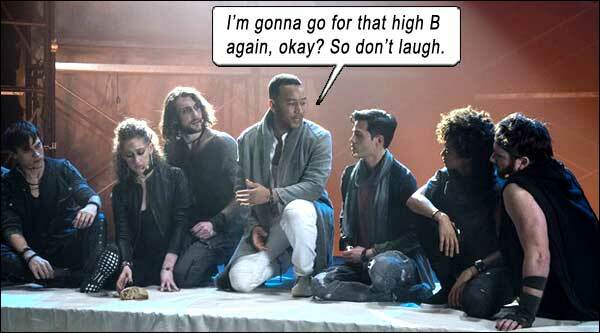 John Legend’s miscasting single-handedly brings down this otherwise very sincere, very inspiring stage production of JESUS CHRIST SUPERSTAR. Like every SUPERSTAR production since the 1973 film, the players are a diverse cast of ethnicities, and I commend the production for casting two black men in the lead roles. But one of them is the wrong black man for the job; the “Superstar” of the title – trounced by every other vocalist in the production! This looks bad, for Christ’s sake! 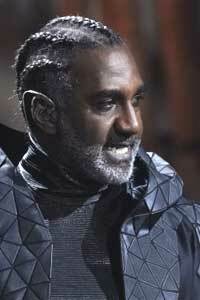 Norm Lewis: Corn Row Caiaphas. The high priests are outfitted in menacing futuristic longcoats, with the basso Caiaphas (Norm Lewis) in corn rows! Jin Ha is suitably fey as Caiaphas’s countertenor lapdog, Annas. During their plot-turning song This Jesus Must Die, the line “One thing I’ll say for him: Jesus is cool!” is changed to “Infantile sermons – the multitudes drool.” This has happened in every production after 1973, and I don’t know why – that “cool” line is so much… cooler. Alice Cooper, definitely the oldest, most experienced stage animal in the cast, hams it up as Herod in King Herod’s Song, but we can’t help imagine how much better this would have been if Alice was drunk and 30. With a snake draped around him. 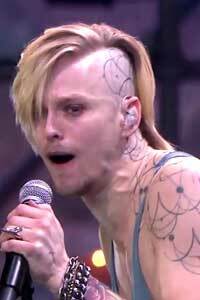 In a cast fitted with headset mics and in-ear monitors, Alice noticeably uses a cordless mic. If Alice doesn’t feel comfortable with the tech, who’s gonna tell him to shut up and use it? It sure seems like ad lib when Herod takes his attention off Jesus during the instrumental to stride downstage and proclaim, “Hello Jerusalem. I am your king!” We’re not worthy! We’re not worthy! The dirt-talkin,’ beer-drinkin,’ woman-chasin’ minister’s son speaks to Jesus. This 2018 SUPERSTAR, directed by David Leveaux and Alex Rudzinski, follows the ethos of every SUPERSTAR, with a modernity to the costumes and looks of the players, allowing the cast to expose their numerous tatts – it’s Jerusalem meets Tommy Hilfiger. And among the Apostles, there are many women, to cater to modern wokeness and to avoid the Jesus caravan being a total sausage-fest. The scenes are well-staged, with the very accomplished instrumentalists wielding their instruments like battle-axes, allowed to move amongst the dancers and actors onstage; the instrumentation itself authentic and cutting, with excellent modern production (although the music mix sometimes ungenerously overpowers the vocals). All the onstage dancers, apostles and extras seem to be outfitted with in-ear monitors and headset mics, and there’s no reason to doubt they are all singing. We can only imagine the nightmare of trying to satisfy everyone’s in-ear monitor mix. Dixon’s tearful breakdown in Damned For All Time and the reprise of I Don’t Know How To Love Him puts him head and shoulders above the cast in the Acting department. 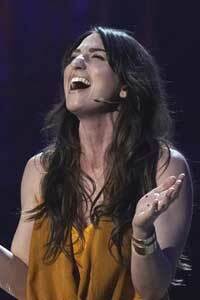 And his name does not even appear on most posters, as the three top billings are Legend, Bareilles and Alice. Yet for all Dixon’s emoting, John Legend once again brings shame to the production, his acting either non-existent or floundering in melodrama. There are segments in songs that require Jesus’s face to reflect that people are not understanding his message: e.g. During Hosanna when the choir chants, “Hey JC, JC / Won’t you die for me?” in the ’73 film, Neeley suddenly looks shocked that the choir “went there”; when Simon Zealotes requests, “…but add a touch of hate at Rome,” again Neeley goes from smiling to sudden concern that his disciples have missed the point. John Legend, on the other hand, keeps smiling through both those somber twists. Dixon, in a glittery chainmail outfit, rips up the grand finale Superstar, following Carl Anderson’s immortal melody lines. In the outro vamp, he screams like the devil is riding him to hell, hitting an A5 not once, but twice! If the staging for Judas’s death scene was creative, then here at last, Jesus can finally outgun Judas, as the crucified Jesus is pulled upwards, and four paneled walls open to create a cross, which crucified Jesus fades back through. It’s a breathtaking climax to a stage production which could have been exemplary were it not for its star. Aka: JESUS CHRIST SUPERSTAR: LIVE IN CONCERT. Directors: David Leveaux, Alex Rudzinski. Writers: Tim Rice, Andrew Lloyd Webber. Starring: John Legend, Alice Cooper,, Sara Bareilles, Brandon Victor Dixon, Jason Tam, Norm Lewis, Ben Daniels, Erik Gronwall, Jin Ha. Broadcast: 1 April 2018, NBC.